The truth is Joan Kaplan is writing a novel. The commitment and the act of producing the drafts doesn’t shock her. She jests…somewhat. No need to call the ASPCA; her dog is very well cared for. Yet while she steadily drafted the opening chapters of her first fiction book, she took a detour and left it all alone for a few months after one spring day at her weekly coaching session with me. She arrived with a tattered pair of treasured recipe collections she had created, one 15 years ago and the other 8. She showed me one group and its intricate mailing package, then wrangled the other photocopied pages escaping the raffia that once decoratively corralled them. Both were fun family projects. 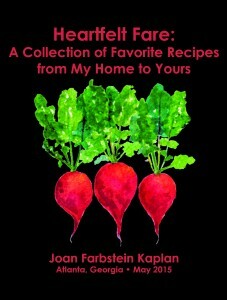 “For each recipe book I create, I combine my love of food, my passion for entertaining, and my desire to give a meaningful gift to friends, clients, and other supporters.” As I examined their uniqueness, she talked passionately about creating another, adding this time she wanted to produce more copies. Maybe 500. Joan looked dismayed, but not deterred. I continued, suggesting a professional layout, 4-color card-stock cover, and spiral binding for durability…and to save her time. She smiled. She smiled brighter…and added even more, sharing the news that her family was starting a foundation to support four charities in her neighborhood of Oak Grove. Proceeds from donations gathered by the distribution of the cookbook would join contributions from her family each time she is involved in a real estate transaction to support Atlanta Hospital Hospitality House, Contribute2America, One Good Deed, and Ruffus Rescue. “Why not combine all of them?” I recommended, and soon we were underway. As she pulled together recipes and wrote stories, I coached her on content while organizing and editing, then I walked the project through the design and printing process. 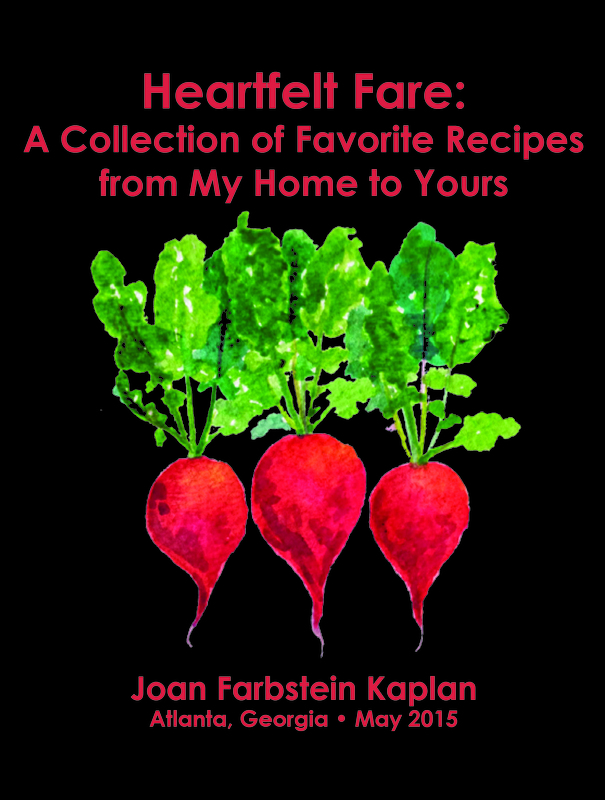 Ten weeks after that initial meeting, Heartfelt Fare: A Collection of Favorite Recipes from My Home to Yours was published. Thus far, after personal and mail deliveries, a rousing launch party at Vista Yoga featuring generous donations amongst fabulous bites and bevs from the book’s recipes, and then additional marketing from Joan, more than 700 are now at home in kitchens. 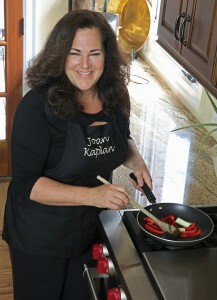 Fueled by the positive response to the recipe book, Joan returned to writing the novel with more gusto. I enjoy it too, but continue to wonder which Friday she’ll bring my favorite mouth-watering dessert from the book—a Lemon-Dream-Come-True! I am quite aware we would simply eat and get little done. And the truth is I’ve got the recipe! Photo of Joan by Karin Koser.